Our first encounter with the jungle came in the afternoon when we visited feeding time at the Orangutan Rehabilitation Centre, a half our walk from Bukit Lawang. 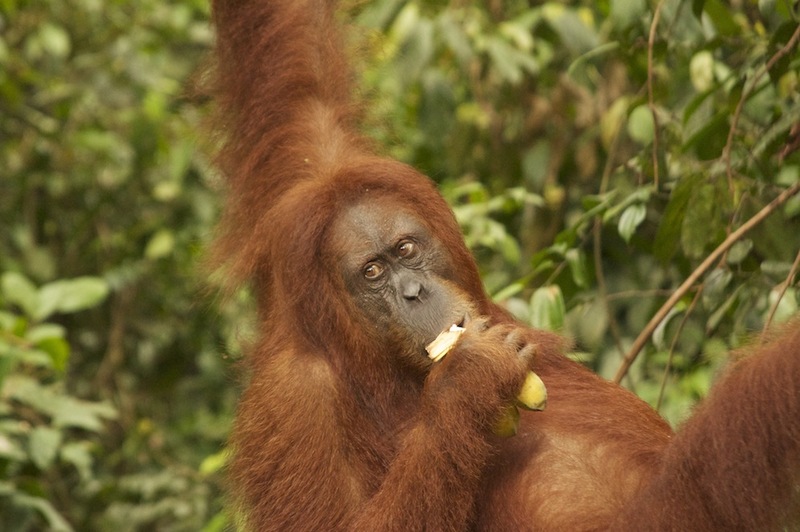 Twice daily food is provided from a feeding platform to supplement the food the orangutans can get for themselves in the jungle. Having been here in 2010 I was hoping for a real spectacle for the group as I had then. It was not to be. Only one, Sandra, turned up. Initially I was disappointed but I soon realised that the lack of animals meant that they were finding sufficient food for themselves and did not need to rely upon handouts. This is the time of year when most fruits are ripening and there is plenty of food available in the jungle. This occasion merely whetted our appetite for what was to follow during our trek. 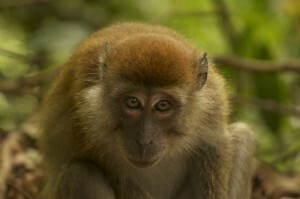 The following morning we left Bukit Lawang for our trek through the Gunung Leusar National Park. Passing through the grounds of the Eco Lodge where Angela and I stayed in 2010, we climbed steadily through a small rubber plantation run by local people rather than a large corporation. Each tree had a spiralling cut of varied width near the foot of the tree. 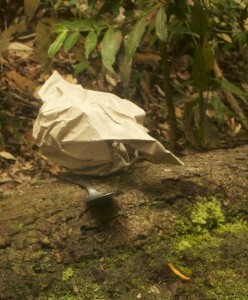 A leaf created the spout for the white elastic sap to drain into a half coconut shell reservoir tied below the cut. It is hard to believe that this method of collection could ever produce enough rubber to satisfy the needs of the world. Sumatra does have some very large rubber plantations but the method of collection is the same and must be labour intensive in terms of collection, although I have never seen anybody collecting the rubber harvest. The boundary between the plantation and the national park could not be more definite. 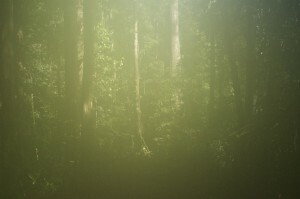 Suddenly the vegetation is very thick and the foliage is very varied. The heat became more intense, as did the cacophony from the invisible insects. It was not long before we saw larger animals, firstly a rustling through the tops of the trees. 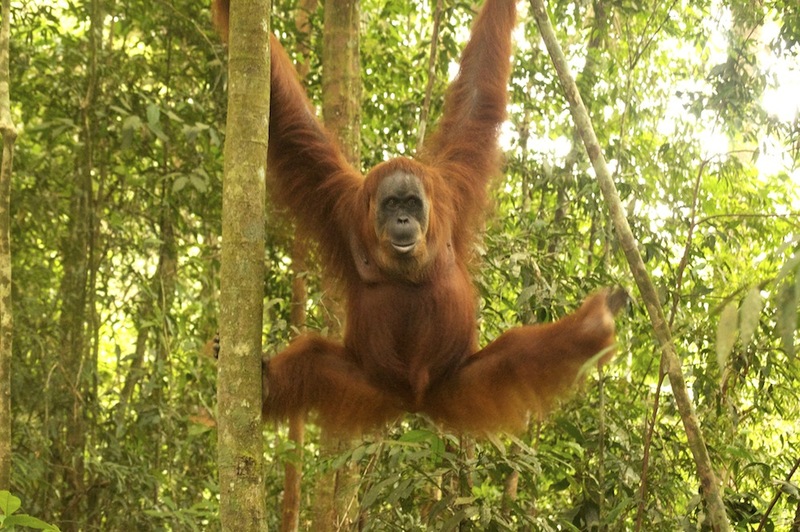 A female orangutan hung languidly in a path side tree with a baby clinging to her fur while a troupe of inquisitive monkeys descended from their tree-top playground to watch us from the side of the path. There was absolutely no fear in them. 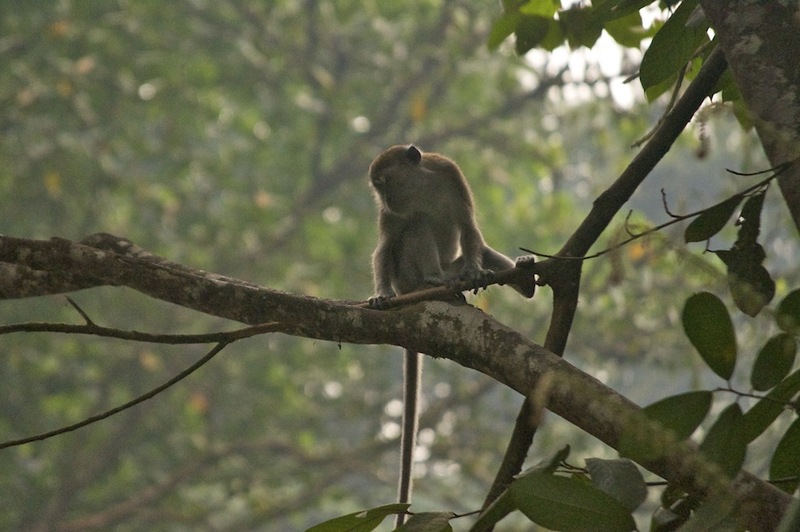 Soon, at a safer distance, a couple of Thomas Leaf Monkeys came to see who was invading their jungle. The orangutan seemed gentle and relaxed and we were able to get quite close without it or us feeling threatened in any way. Shortly afterwards we came across a lone male, much larger than the females, and much more able to inflict some damage. They can be a bit aggressive and this one, having spotted Tango, our cuddly toy orangutan ‘wally award’, became agitated as he believed we had stolen a baby. Surya, one of our guides, took it off Fred and put him in his pack to defuse the situation. It took our lone male a while to settle down, with much thrashing of branches and angry gestures before calm returned to the jungle. 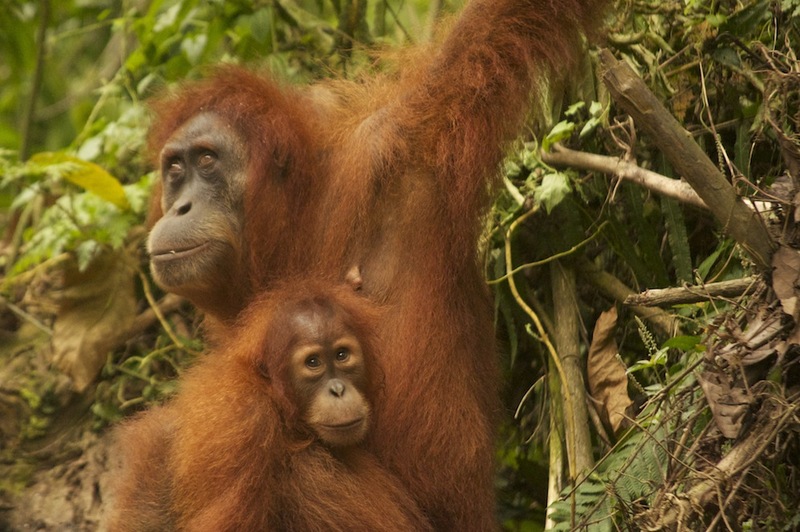 Orangutans have two dominant emotions, jealousy and revenge. We did not want to incur either. The trail climbed steeply and descended steeply; there are no gentle slopes in the jungle. Between the ascents and the descents there were lovely ridge sections, but, because of the density of the trees, there were not far reaching views, just more trees. 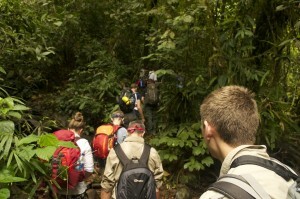 The paths are narrow and the further we delved into the jungle they appeared to be less used. 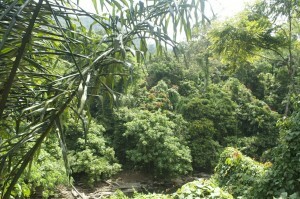 At times, our guides drew their long jungle knives and hacked a way through the foliage for us to follow. Some of the trees are huge, reaching 150 feet and more into the canopy and beyond. We could hear birdsong among the insect noise but they were impossible to see amongst the foliage. Most seem to inhabit the canopy and not venture beneath. We heard Hornbills and on a couple of occasions caught a glimpse of this huge bird flying above the canopy. The variety of foliage was diverse with some plants having smooth, shiny leaves, some velvety and others with vicious spikes which tore at the skin if you brushed past them. Similarly, some of the stems of young trees were dangerous to touch and care had to be taken when using them to pull you up the steep slopes or to defend against gravity on the descents. Underfoot it was interesting. There was an enormous amount of leaf debris and fallen trees to negotiate. Using a pole, it often sank a foot or more into the soft leaf bedding and the soft soil below. The steep slopes were often quite treacherously slippery but there was always a helping hand from the crew over the more difficult sections. The heat was indescribable. Soon after starting walking the sweat began to poor and after a while my shirt was completely soaked and gaining weight. Every-so-often I would have to divest myself of my shirt and ring it out, each time extracting a good half pint of sweat. I can honestly say that I have never sweated so much in my life, but I can also say that the heat and humidity was not as debilitating as I had expected and, certainly, as the the days wore on you became more accustomed to it and also more accepting. Towards the end of the first day, while on the final steep descent into camp, I went over on my ankle and wrenched the tendons and ligaments. I thought and hoped at first that it was just a temporary setback but as dizziness clouded my brain I knew it was a little more serious. Wanto and Surya insisted I rest and took my boot and sock off. Surya took some oil from his pack and thoroughly massaged my ankle. Eventually I felt able to continue the short distance into camp but the descent was difficult. I accepted the helping hands that Wanto, Surya and Eyan offered and made it into camp. If I put my foot down straight I was fine but that was not easy on such a steep, uneven and often slippery surface. While I was able to continue with the trek I remained cautious and particularly nervous of downhill sections. Camp was a series of wooden framed shelters with sheets of polythene tied to them. 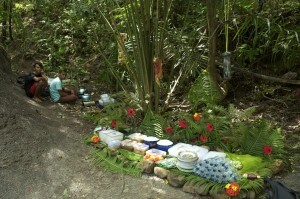 There were two sleeping shelters and two cooking shelters beside a small river. Each sleeping shelter had a line of thin mats for us to lie on. From the frame above we were able to fix our mosquito nets and there we would sleep, probably not needing any extra warmth from our jungle sleeping bags. All cooking in the kitchen tents was done on wood fires. Clearly these chaps knew what they were doing for the food they produced for the twenty one of us and themselves was outstanding. The river was a God send as everybody took advantage of it to cool down after the day’s trek. Photography proved to be more complicated than I expected. Because it was so hot and I was sweating so much, every time I put the camera to my eye my glasses steamed up and I could see nothing; frustrating when trying to multi photograph orangutans. Humidity inevitably got into the camera, steaming up the lenses and the mirrors, requiring me to take the lens off and wipe all the pertinent surfaces only for them to immediately steam up again. One or two clips of video start clear but gradually mist up adding to frustration and atmosphere in equal measure. That first night in the jungle we ate dinner by the water’s edge, a superb feast, with an orchestra of insects to entertain us throughout. 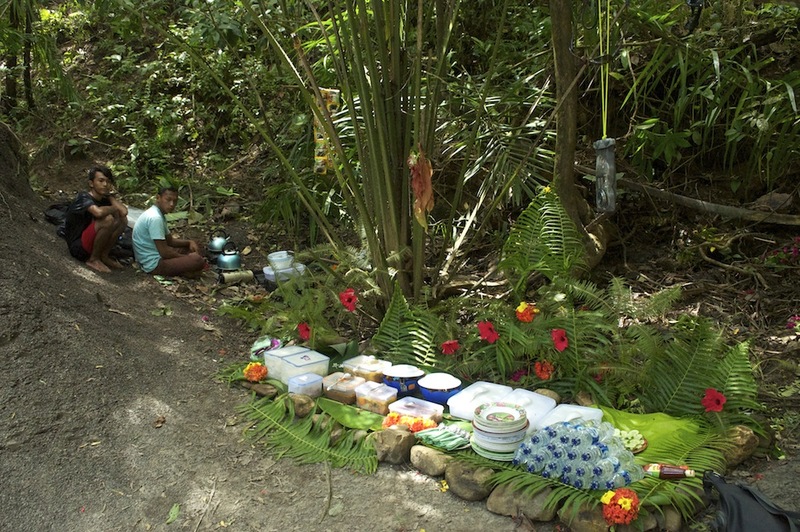 It was Helen’s 29th birthday and instead of the usual pineapple and watermelon pudding the crew produced a chocolate cake they had carried through the jungle, alight with candles. Ahmed Tarzan presented it dressed in a leaf skirt and crown with mud smeared on his face and torso. We sang several versions of “Happy Birthday” before Helen cut and distributed the cake. The rest of the evening we chatted to the crew, Tarzan providing some entertainment, and relaxed. If we thought the jungle was noisy in the day time, the level of noise was nothing compared to that at night. There seemed to be a competition amongst all the insect species as to who could make the most noise. The noise combined with the sticky heat made it very difficult to drop off to sleep but it eventually occurred. Inevitably during the night I needed to vacate the shelter and find a bush. As I turned to return to the shelter I almost stepped on a black/grey snake about three feet long and no thicker than my middle finger. Stepping over it it slithered away into the undergrowth. It seemed less concerned about me than me of it. Back in the shelter I had to wait for sleep to over come me, the noise and the heat, rather than forcing it to happen. The next morning saw us walking up stream for about forty minutes before climbing steeply from the riverbed for and hour or so to a ridge. the ascent was pretty steep and required many a pull-up from a path side sapling. Once up on the ridge it was much the same as the previous day with occasional encounters with animals and a lot of trees. Lunch proved to be as good as all the other meals despite the manner in which it was served and we ate it. Each morning the kitchen staff would cook noodles, vegetables, eggs etc. and pack them in banana leaves and then in brown, almost grease proof, paper. These packages would be carried by the crew and at the appropriate time and place we would sit to be handed our own lunch package, which remarkably, still contained some warmth from the cooking. Once eaten, all rubbish was collected and there would be no trace of evidence of us having eaten there, except for the few stray noodles or bits of vegetable being carried away by armies of ants. Pudding was always fresh pineapple and watermelon, beautifully presented on a carpet of palm leaves with flowers to decorate. That evening we dropped down to another riverside camp, this time the river being significantly larger and giving greater opportunity for swimming and water play. Just before we reached camp we came across a Monitor Lizard and another, very sociable orangutan with a youngster. We found ourselves moving back as the adult and then the youngster joined us at ground level and kept approaching us. It was not that we feared her but wanted to maintain the statutory distance from them. Later, when another group arrived at a nearby camp, we saw the mother orangutan walking hand in hand with some of the people. While it must have been an immensely pleasurable experience and I could not help wishing I could hold an orangutan’s hand, I also felt that these people had broken the rules of the jungle, however willing the orangutan had been for contact. As we relaxed and swam in the river there was animal activity all around us. 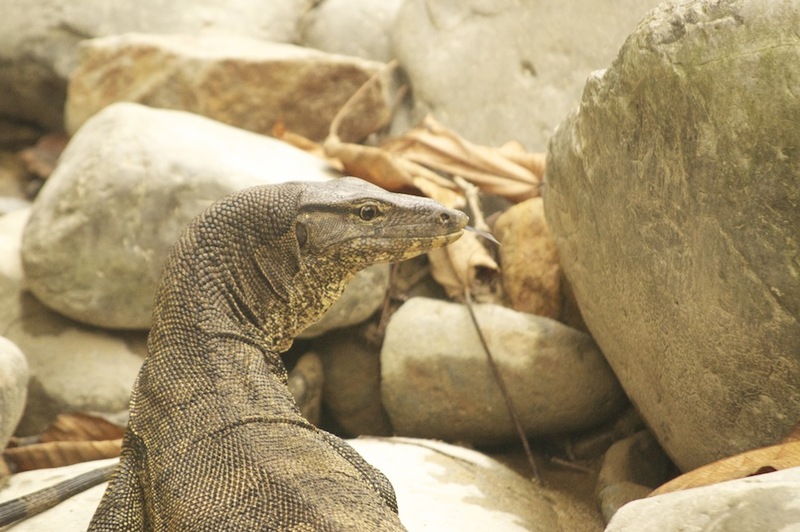 Another monitor lizard came down to the rocks at the water’s edge in search of titbits, its flicking tongue delving into nooks and crannies. Remarkably he seemed to find quite a feast. This was followed shortly afterwards with a troupe of monkeys travelling upstream on the other side of the river. 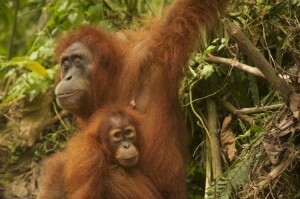 There must have been about fifty of them from dominant males to babies clinging to their mother’s chest. They were clearly on the lookout for some mischief and with a couple of groups camping nearby there was also clearly fun to be had. Soon, there was a rustling in the trees above our camp as another monkey was playing in the branches and watching us. Was this just a lone monkey or a scout for the troupe we had recently seen, or indeed another troupe whose territory covered our side of the river? We soon found out when a whole swathe of movement rushed through the trees as a similar sized troupe passed over our heads. Their fun and games was a joy to watch as they chased each other, leaping from tree to tree and achieving impossibly daring treetop crossings, grasping at the flimsiest of twigs to prevent them falling to the ground below. It took several minutes for the spectacle to pass over our heads but we did wonder whether they would return during the night to steal our drying clothing draped around camp. With all our clothing still hanging around camp but hardly any drier than they were when first hung because of the humidity, we prepared to continue with our trek. 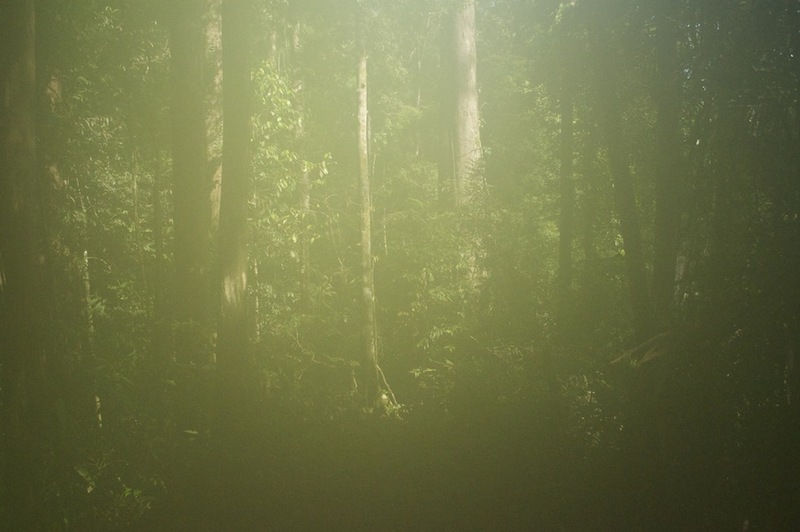 As we delved further into the jungle we saw less and less wildlife – no more orangutans, monkeys or lizards, just a lot of dense foliage and a mass of insect life. Under attack. Note the piece of carrot being carried at the foot of the picture. Our main animal interest came from armies of ants carrying off the remains of Magda’s lunch. The team work was incredible and it did not matter how large the debris was there were always enough ants to manage the task. We even set them challenges by giving them increasingly large pieces of watermelon. Nothing was too difficult for them and when a large ant almost an inch long tried to cash in on the food crop it was very severely chastised and chased off. We also had problems with bees on this part of the journey with a number of girls being stung several times as they disturbed a bee’s nest in a tree they flicked past. It was my turn to do the same the next day receiving about eight stings to my face and neck. The terrain was much the same with more steep ascents taking us up to above 800m above see level, long ridges and steep descents. On this third night we did not have the luxury of a river to cool down in as camp was in a cleft just below the ridge line. It was such a tight spot that we all had to huddle into one shelter while the crew and the kitchen shared another. 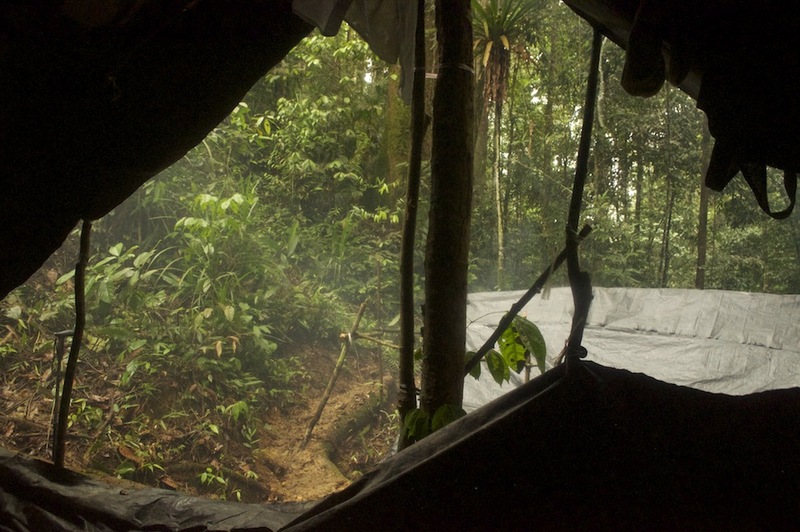 Very shortly after arriving at camp we experienced our first tropical rain. The rain hammered on to the polythene shelter and even larger drops from the overhanging trees thudded on to our canopy. The track outside became a treacherous skid pan of mud and visits to the toilet became hazardous. Keeping the mud out of the shelter became a challenge. In the distance thunder rumbled and as darkness came we could see flashes of light through the canopy of trees. The enterprising crew erected a hand rail around camp and towards the toilet area as well a cutting lengths of wood to put across the muddy path to try to give us some traction. The rain continued into the evening but lost a lot of its force as night approached. By morning the rain had been replaced with sunshine and the path beyond camp was remarkably dry considering. The dampness really affected the camera and it took a while for that to dry out. The walk today, instead of taking us further into the jungle it brought us to the edge and another river, which formed the boundary between it and palm oil plantations on the other side. We managed to reach camp in good time and had plenty of time to play in the river. 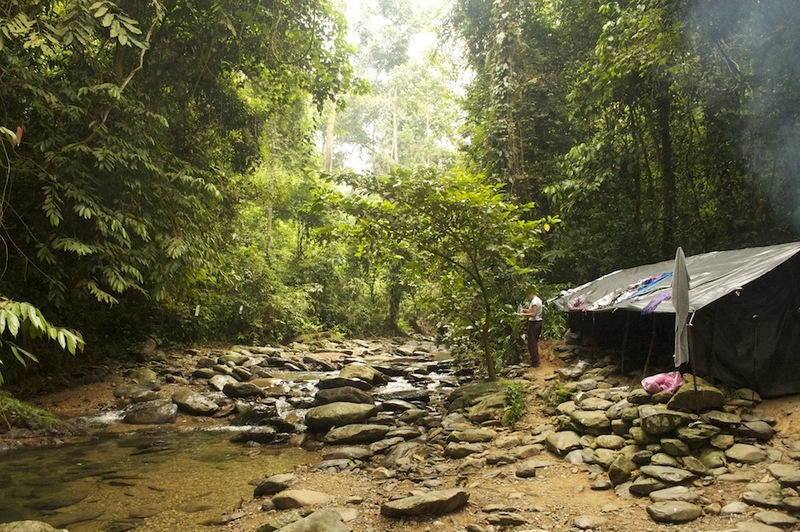 Our shelters for the night were stilted buildings in a small clearing by the river. The clearing was only made recently and I imagined that if I came back in a couple of years there would be a proper lodge here with gardens, vegetables growing for the kitchen and a road from the other side of the river. As it is at the moment the facilities are very basic but it proved a lovely spot to spend our last night of jungle trekking. The river fulfilled its purpose as a place to swim and play, to wash clothes, bodies and hair, and had there not been some very persistent biting insects just above the surface of the water it would have been perfect. After dinner it was party time; the singing and the games went on for some time. There was a special bond between us and the crew, who very obviously enjoyed what they did, who’s knowledge and understanding of the jungle was better than anyone’s, who felt immense pride in their jungle environment and were determined to protect it and maintain its pristine condition. 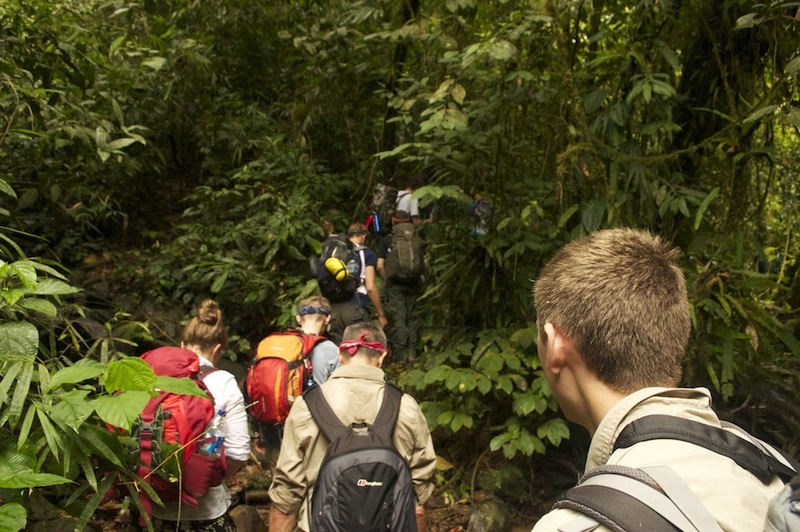 We had walked 50 – 60km over the four days we were in the jungle and it had been a privilege to be there to share the experience and to learn from the enthusiasm of our guides. The following morning we crossed the river and walked briefly through the palm oil plantation to a waiting lorry to take us to Tangkahan, a small resort on a river skirting the edge of the jungle. We were spending a couple of nights here to conclude our Sumatran jungle experience with elephants and river tubing. The hotel was fairly basic but ideally positioned for what we were doing. The highlight was the restaurant which was built on stilts from the cliff above the river with views straight down into the water from the balustrade. When we were told that we would not be able to ride the elephants as they were already pre-booked. I was pleased. Bathing elephants is a much more memorable and personal experience and by not riding them we were saving a considerable amount of money each. It took a while to convince the group but the events which followed needed no further convincing from me. 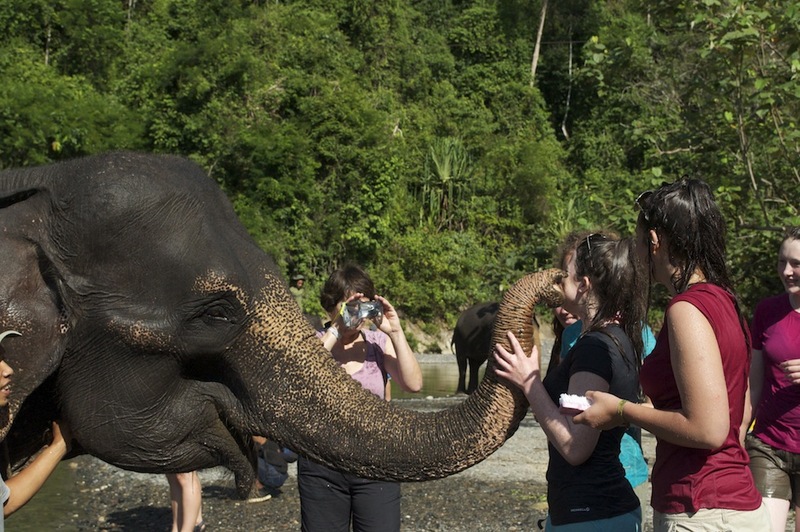 We followed the elephants, including a baby, down to the river where they first had a play without human interference. The baby was not too keen to enter the water and had to be coaxed to take the plunge. There was one male elephant and several females. 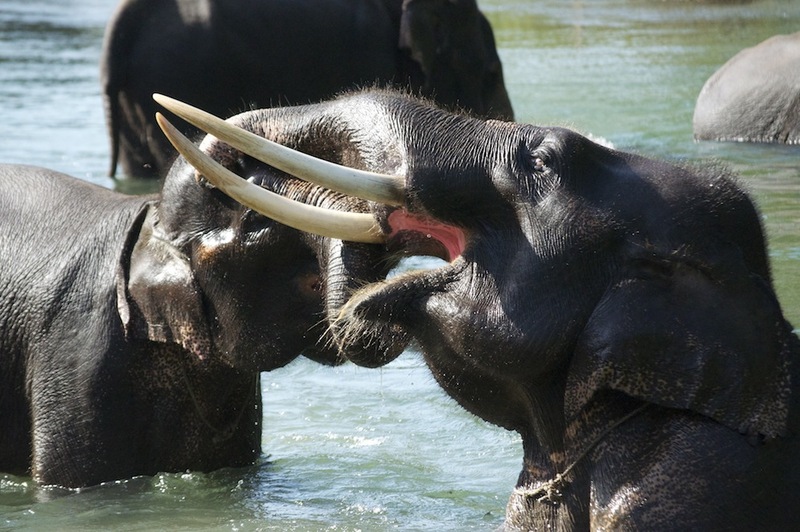 The male and an affectionate and playful female had a wonderful romp in the water, intertwining trunks, sitting on each other, kicking each other and having a really good time. Eventually the group was able to mix with the elephants and armed with scrubbing brushes set about giving them a good scrub. By way of thanks the elephants were given the opportunity to wash their human partners. Taking a trunk full of water they showered their group and also gave some a full facial assault. Then the elephants kissed their human counterparts on the cheek with the end of their trunks. It was all a bit of a performance but the elephants seemed to enjoy it as much as the humans. As soon as we had finished with the elephants we took possession of our lorry and bus inner tubes and set off down stream, allowing the speed of flow to carry us peacefully through the landscape. Occasionally the water became a little lively but these interludes were only short-lived. Whenever there was something of interest we would pull into the bank and explore up a small tributary where we would find a waterfall to walk through. Remarkably, there was no shock factor with the water temperature; it was always very pleasant. On another occasion we ventured up a small side valley to dip our feet into a hot thermal pool in a cleft in the rocks. The hot water spilled out into the river, adding to the warmth of the water. There was a slight smell of sulphur in the area which was a little off-putting. There was also a rock jutting out into the middle of the river from which we could jump safely off in to deep water. For lunch we went up yet another side tributary to a pool with a forty foot waterfall. Here we would have lunch but before that there was plenty of time for playing in the pool, lying underneath the waterfall for a pummelling massage. The crew, all very young men, set out a fantastic spread for lunch and it was all so very well presented. These young men have been given the green light to provide a service from the tourist authorities. Not only are they the river guides but they also provide the lunch, the logistical transport support and some of them seemed to be involved with the running of the Green Lodge in Tangkahan, where we were staying. When our laundry was returned, it was they who returned it. Based on their performance and the attention to detail they had shown us, they will go far. Everything is done with a smile on their faces and they would be an inspiration to any young people looking for direction into adulthood. After lunch it was another short spell of drifting down stream until we reached our rendezvous with the transport to return us to Green Lodge. This brought to an end our Sumatran jungle adventure. The next day we would spend travelling to our next adventure on the island of Java. This entry was posted in Indonesia 2013 by jwalton. Bookmark the permalink.